There is a reason the Muppets have instant universal appeal. As we've discussed, most of Henson's classic sketches rely on three things: recognizable/catchy music, physical humor, and gibberish. These concepts are not bound by language, and so, any person viewing one of these sketches will understand the premise immediately (even if they feel that what they are seeing looks a little bizarre). Early puppets were designed as abstract beings to deliver the most effective visual punchline. They were not based on any animal and lacked any familiar facial features, save for whatever was necessary to convey that these were living creatures, not inanimate. When constructing The Muppet Show, Henson wanted to include these old bits and routines, but the absurdity of them seemed out of place given the conceit of a '70s variety show starring actual people (not puppets). Here, people/animals spoke English and behaved in a funny, yet relatable fashion. In order to connect the old and the new, someone came up with a clever setting to house these types of skits. Because the old routines were filmed on variety shows with minimal set pieces, the focus was always on the puppets, not the blank backgrounds. A stark, barren planet was invented that mimicked the look and feel of these former sketches. 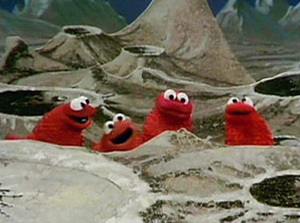 With very little in the way of atmosphere and scenery, any creature the puppeteers wanted to use could potentially be alien beings from this far away planet! The planet Koozebane was born! The Muppet Show version of "Scrlap Flyapp," a.k.a. "Hugga Wugga"
Rocky craters, billowing mist, and little to no vegetation was the norm on Koozebane (named after Coos Bay, OR, which Henson thought was the silliest place name ever). Old abstract Muppets found their new home on this planet and new abominations were able to surface. All that was needed to connect it to the "real world" was a familiar face to reassure the audience. 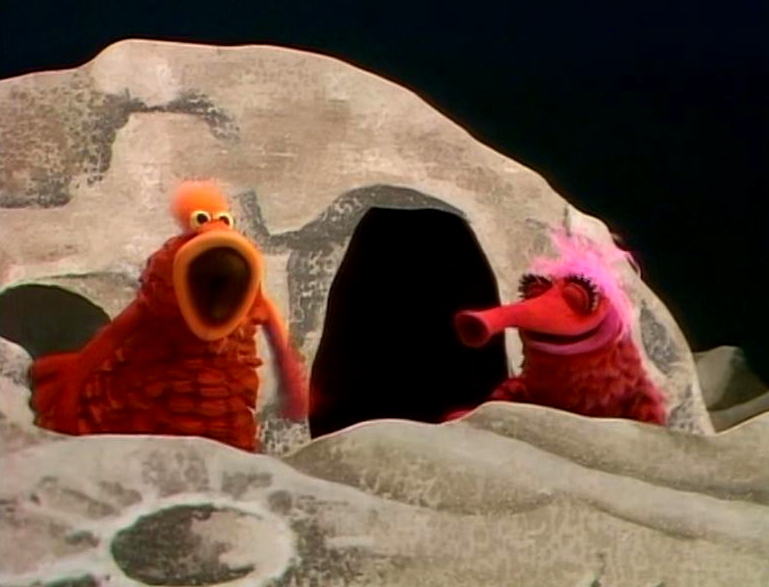 News reporter Kermit the Frog was on hand to present the audience with the first look at Planet Koozebane in this infamous sketch about the bizarre mating ritual "Galley-Oh-Hoop-Hoop." This sketch helped establish that Koozebane could be used to cross all sorts of cultural barriers. Although Kermit is describing the circumstances in English, it is evident what the two creatures are feeling/doing. And the appeal is not just for different ethnicities, either. Adults and children can appreciate this sketch as well, even though children will be unaware of actual mating. They see two funny aliens that crash into each other and explode, resulting in babies. That's just good comedy no matter who you are. Kermit would visit the planet regularly to observe many of the unique species living on the planet, including the rapidly-evolving Phoob and the mostly liquid Spooble. Every visit would result in more species waiting to be discovered and some would even trek to Earth. Of course, being an interstellar planet, Koozebane would eventually receive contact from the Pigs in Space crew. Although, being the pig's-knuckleheads that they are, their efforts to create history are botched as soon as they set foot on the planet. Despite the obvious fact that it is swimming with life every time we see it, the pigs are unable to notice what is right under their nose. Link's fear of "little green monsters" encourages him to hightail it home as soon as it is "discovered" that no life forms exist on the planet. We checked a five-square-foot area. We're done. Not even highly combustible amphibians are safe from the true menace of Koozebane. 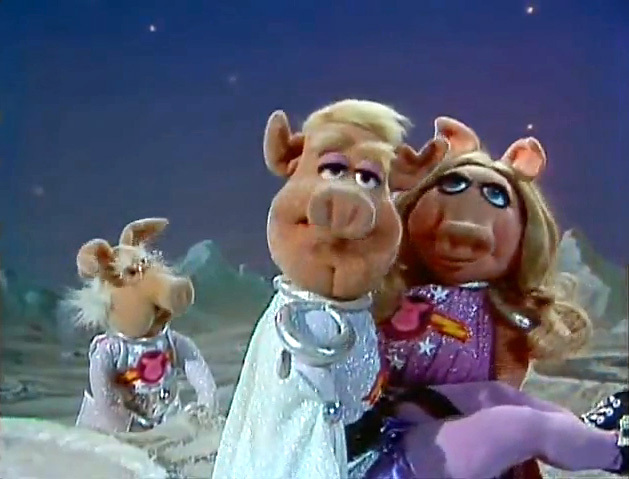 Tune in tomorrow for the heart-pounding, secret-revealing, tap-dancing conclusion to PIGS IN SPAAAAAAAAAAAAAAACE!